Pack of 75 multicolored Male to Male Jumper Wires for quick and easy prototyping. 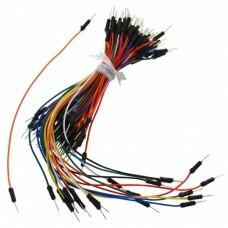 This set includes jumper wire of varying lengths and comes in a mixture of eight colors to help identify connections. These jumpers are ideal for making connections between your robot's microcontroller and external modules or for use directly on a breadboard. Colors include red, white, blue, yellow, orange, green, brown and black. Each jumper wire is 22AWG with solid male pins that fit easily into standard headers and breadboards.